Books at Wilson: "Branding Humanity: Competing Narratives of Rights, Violence, and Global Citizenship"
On January 23, Dr. Amal Hassan Fadlalla returned to the Wilson Center to launch her new book on Sudan, Branding Humanity: Competing Narratives of Rights, Violence, and Global Citizenship, which was written based on research she conducted at the Wilson Center. Dr. Marisa O. Ensor, Research Professor with the Justice and Peace Studies Program and Institute for the Study of International Migration, at the Georgetown University School of Foreign Service joined Dr. Fadlalla. 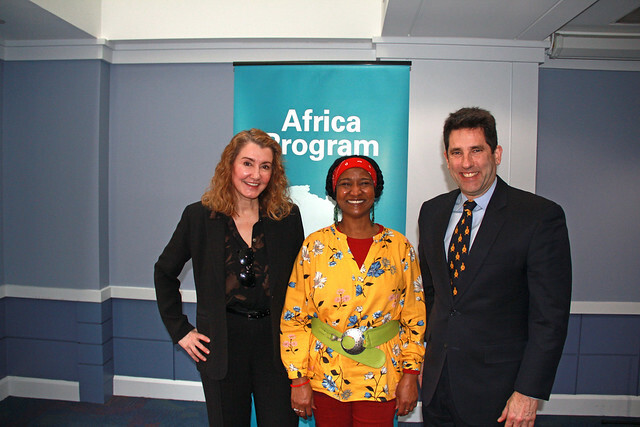 Mr. Mike Morrow, Senior Diplomatic Fellow with the Wilson Center Africa Program, moderated the event. Dr. Fadlalla began the discussion by noting that activists in the Sudan and in the Sudanese diaspora have inspired her book. Sudan has always been an extremely diverse country, with a multitude of ethnic groups — each with their own history, languages, and claims to land and heritage. Since independence, efforts to build an inclusive national identity have largely failed to bridge gender, race, class, and ethnic divisions. These divisions have led to conflict, the emergence of a large diaspora, and the partition of the country. In Branding Humanity, Dr. Fadlalla analyzed how different actors have mobilized identity politics in Sudan, and how Sudanese at home and overseas have contested and reshaped these dialogues. She noted that the narrative of ethnic conflict espoused by human rights and humanitarian organizations failed to capture the full diversity of the country — ultimately contributing to further divisions and conflict. In her research, Dr. Fadlalla found that many Sudanese who did not align with either Islamism or human rights-focused humanitarianism — especially those in the diaspora — instead created their own spaces. In this “diaspora public” Sudanese activists and leaders built platforms for more nuanced dialogue, debate, and protest. She closed by noting that the identity politics engaged by Islamist and human rights organizations had failed to include minority citizens both nationally and transnationally, and that identity politics should not yield to existing conditions, conservative politics, and hegemonic understandings of citizenship. Dr. Ensor commented on the unique approach of the book, and discussed with Dr. Fadlalla about how her approach provided an insight that was different from a political science or historical approach. They discussed what some of the actionable lessons from the book might be, with Dr. Fadlalla noting that while the social divisions in Sudan had only deepened among the diaspora, she was confident they could still be overcome. As evidence of this, she cited the ongoing protests in the Sudan, where protestors are using slogans calling for national unity and an inclusive nation-state. Drs. Fadlalla and Ensor observed that existing social divisions tend to extend to cross-border groups, often deepening; and that identities take on new meaning, and are manipulated and instrumentalized. Dr. Fadlalla noted that her experience as a woman of Sudanese origin had not prevented her from being challenged (and sometimes rejected) by other groups of Sudanese — clarifying that identity is not always as simple as an insider/outsider divide. Both speakers acknowledged the role that climate change plays in exacerbating poverty and conflict in the region. Finally, Dr. Fadlalla observed that there is an active and diverse civil society both in Sudan and in the diaspora, including many groups that have stepped in to “fill the gaps” where the state has failed to provide services.